Trump Has Revealed Assumptions About Handling Presidential Wealth, Businesses Trump has continued to own a business empire while serving as president — thus showing that expectations about handling presidential wealth, businesses and brands were about norms, not laws. 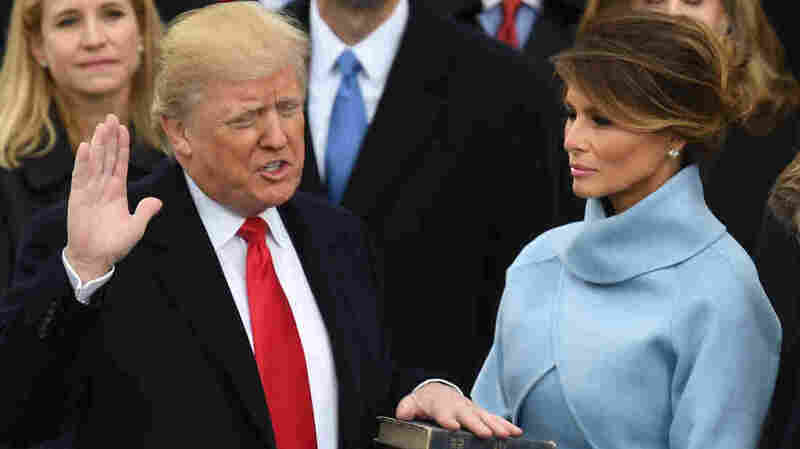 Donald Trump, with wife Melania, is sworn in as president on Jan. 20, 2017, at the U.S. Capitol in Washington, D.C.
Before Donald Trump took the oath of office one year ago, the presidency was widely seen as an all-consuming, full-time job. But since Inauguration Day on Jan. 20, 2017, Trump has served as president while holding on to his hundreds of businesses. He has continued to promote his Trump-branded properties, spending roughly a third of his presidency dining at his own restaurants, golfing at his own courses and sleeping at his own luxury hotels and resorts. As Trump has often pointed out, a law setting ethical standards regarding self-enrichment applies to federal employees but exempts the president and vice president. "The law is totally on my side, meaning, the president can't have a conflict of interest," he told The New York Times shortly after the election. By underscoring that one legal exemption, Trump has called attention to this political reality: Ethical norms for the presidency are just that — norms, not legal requirements. In the modern era, previous presidents have sold off their holdings or put them into professionally managed blind trusts to avoid conflicts of interests. But they did so by choice. Over the past year, Trump has shown that such traditions can be ignored. 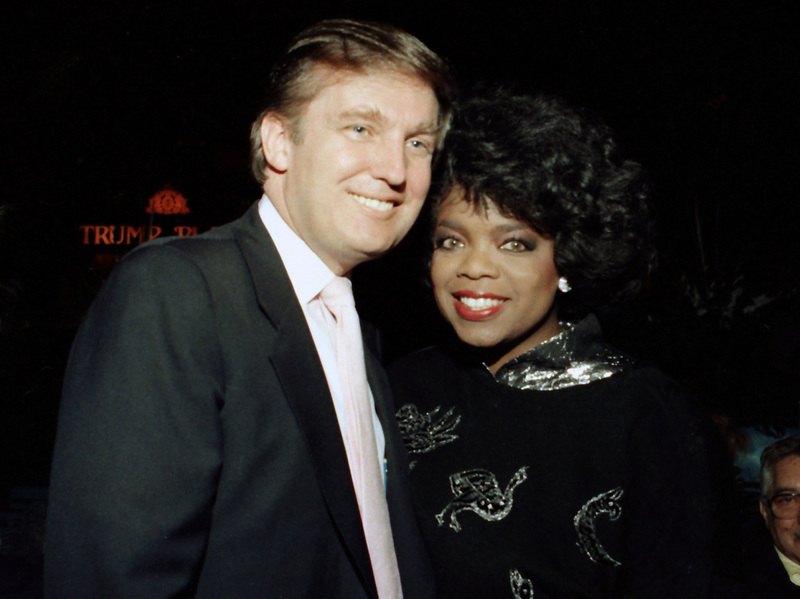 Now, when celebrities, such as Oprah Winfrey, Dwayne Johnson, aka "The Rock" or Shark Tank judge Mark Cuban, are floated as possible presidential candidates, not much is said about their need to divest from brands and businesses. "We have become inured to the conflicts of interest that continue with Trump's business holdings," Washington ethics lawyer Ken Gross said. "We've been overwhelmed by so many other events with this administration that we've put the ethics issue on the middle burner," rather than a front burner, he added. On the first anniversary of Trump's inauguration, here's a look back on the road we have traveled on the way to becoming "inured." Rather than divest, Trump moved his businesses into a revocable trust. He is the sole beneficiary of the trust, which is managed by his two older sons and a business associate. He knows what businesses are in the trust. Trump and Oprah Winfrey are pictured together in 1988 in Atlantic City, N.J. Winfrey's name is being floated as a possible presidential candidate. At a press conference on Jan. 11, 2017, Trump lawyer Sheri Dillon confirmed that, saying: "You cannot have a totally blind trust with operating businesses. President Trump can't unknow he owns Trump Tower." The Trump Organization also continues trying to expand the family business, seeking and accepting new trademarks in China. Trump's sons still pursue business expansions around the globe. Trump has been hit with one lawsuit after another as various entities have tried to prevent him from potentially enriching himself while in office. But Trump the businessman remains inseparable from Trump the president because demands for change have not resulted in any legal requirement to divest, use a blind trust or limit the ways he might be enriched by his businesses while in office. For example, the General Services Administration, which owns the historic Old Post Office building in Washington, D.C., has not demanded that Trump surrender his lease to operate a hotel there. A federal judge has thrown out a case brought by an ethics group that contends Trump must sell off his properties to comply with the Constitution's anti-corruption clauses. The Republican-controlled Congress has not pushed Trump to divest. All of that may be shifting public perceptions of the presidency. A recent poll by the nongovernmental organization Transparency International showed 44 percent of Americans believe that corruption is pervasive in the White House, up from 36 percent in 2016. Ethics lawyer Gross says he believes it's possible that after the Trump administration ends, the traditional ethical norms will snap back. He said of Trump's conflicts: "I hope they didn't create a precedent."